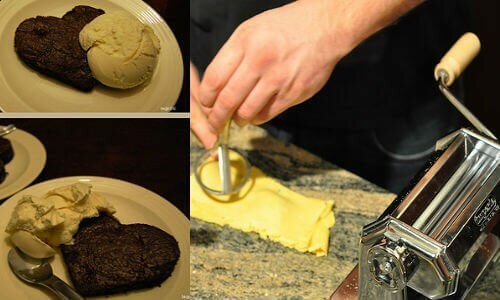 to create your sheets of ravioli dough. Brush egg wash all over one sheet of ravioli dough to act as glue. Use a tablespoon to scoop the filling you have made onto the same sheet with egg was. Place as many tablespoons as you can on the sheet while giving enough room in between them to allow your ravioli stamps accurately cut your ravioli shape. Use your ravioli stamps in the shapes you’ve chosen and cut out the pieces of ravioli. You can create semi-circles by using half the amount of filling per ravioli and folding circle shaped ravioli in half. If you want to take an extra step to secure the filling, you can press the ravioli’s edges down with a fork. Now your fun shaped ravioli is ready to be cooked and enjoyed!
. They also come in seasonal shapes like four-leaf clovers, Christmas trees, and Easter eggs so you can create your own collection to use for holiday events! What are your favorite shapes to work with when cooking tasty treats?